I’m still a relative newbie when it comes to craft beer. Great Lakes Brewing Company was one of my Philly Beer Week discoveries when I had there Elliot Ness Amber Lager at Vargas Bar. Since it was such a good beer, I thought I should branch out and try some of their other varieties, so I picked up two bottles of their Burning River Pale Ale during my pre-Thanksgiving beer run. Per their website, Burning River is “an assertively hopped American pale ale with citrusy and piney Cascade hops”. It has an ABV of 6%, and is available year round. Appearance: Cloudy copper color. Very little head that dissipates rapidly. Good bit of lacing on the glass. Aroma: Honey and orange zest mixed with mild pine scent. Taste: Moderate carbonation. Malt sweetness at first, followed by citrus and some very mild hop bitterness. Long, pleasant finish. I made a rookie mistake when I bought this beer two weeks ago. I checked the “Sell By” date AFTER I brought it home. The date was 7/28/2010. I bought it on 11/24/2010. Turns out there was no need to worry. 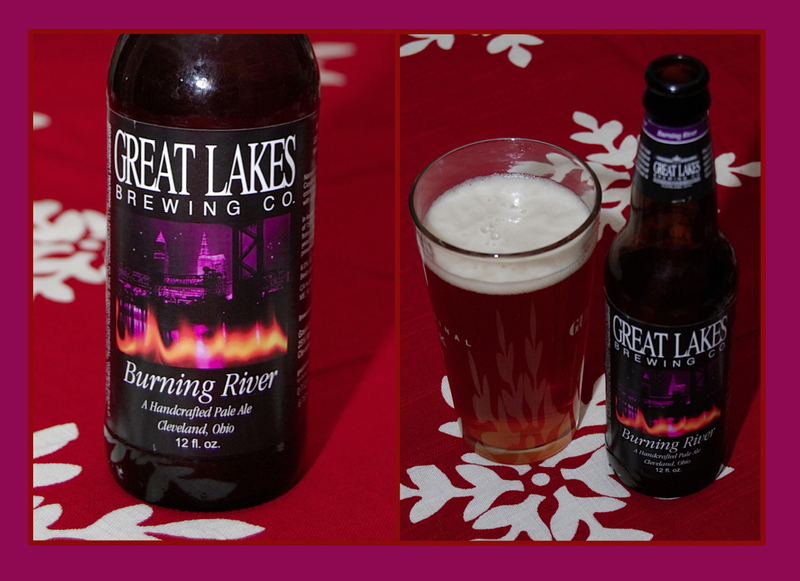 I had a bottle of the Burning River Pale Ale with my dinner this past Saturday. I liked it so much that I just had to write it up for the blog. It’s crisp, clean, and very easy drinking. It would be a fine accompaniment with a wide variety of food, or you can just have it on its own. I give it a B+. If this is what it tastes like 5 months past its prime, I can only imagine what a fresher or draught version would be like. Well done Great Lakes! Being from Cleveland, I naturally gravitate toward Great Lakes beers, but I can honestly say that the Edmund Fitzgerald Porter is my all-time favorite. Whatever they’re doing, they’re doing it perfectly. And thankfully, it’s not too hard to find around Philly. I haven’t had their Porter yet. Like I said in my post, I hadn’t heard of Great Lakes Brewery till Philly Beer Week this past summer. Now I see them everywhere! Which is a very good thing since they make some really good beers.